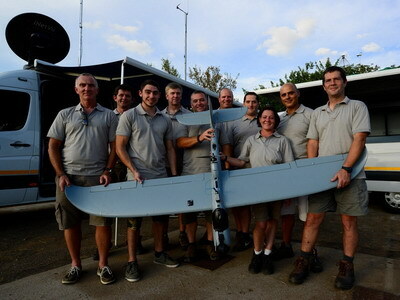 UAV & Drone Solutions’ (UDS) Air Shepherd programme, developed to protect elephants and rhinos from poaching by using drones, has started new operations in Botswana. The announcement on 8 June coincides with the unveiling of an alliance with the University of South Carolina’s (USC’s) Artificial Intelligence (AI) department in the development of a poacher detection program called SPOT — Systematic POacher deTector, capable of spotting poachers in less than half a second. This new technology will be implemented to assist all Air Shepherd teams moving forward. Additionally, the scientists working on this algorithm modified it for speed by leveraging the power of Microsoft Azure and the cloud to build a virtual computer that could accelerate the process. An alternative solution was also developed to allow for spotty interconnectivity in rural areas. “SPOT will ease the burden on those using drones for anti-poaching by automatically detecting people and animals in infrared imagery in near real-time,” said lead author Bondi. Air Shepherd, originally developed by the Lindbergh Foundation in conjunction with South Africa-based UDS, has flown in multiple African countries, including South Africa, Malawi, Zimbabwe and now Botswana. The Lindbergh Foundation then transferred ownership of Air Shepherd to UDS. “With more than 30,000 flight hours, Air Shepherd drone teams are pushing the boundaries of drone technology by flying 25 km beyond the line of sight and at night—when poachers operate,” UDS said. The program uses intelligence from multiple sources while infrared-capable drones fly silently. Previously, poachers were spotted on the ground by an Air Shepherd team member monitoring infrared camera footage from the drones all night, which can cause fatigue. The SPOT program will remove that challenge from the equation by automatically detecting poachers. Rangers are then sent to intercept them. UDS said Air Shepherd drones offer more protection for rangers who, while patrolling at night, are exposed to a high level of danger from armed poachers and wild animals. Air Shepherd’s experience on the ground has shown that when they are flying drones, poaching stops, the company said.